Can WP-Lister automatically create orders in WooCommerce? Can I trigger the check for new orders manually – or from an external script? I added new categories to my eBay store but they don’t show up in WP-Lister. Can I include a gallery of my other items as part of a listing template? How do I get discount on listing fees? Can I manually relist an item on the eBay website? How should I list test products that do not show up in search results? When I change the product name, why doesn’t the name shown on the listings page get updated? Why do links in my product description not show up on eBay? Which eBay categories allow variations? What is the difference between “splitting” and “flattening” variable products? Can I change a profile after listing items on eBay? How to enable free shipping? How does the inventory sync work? How to enable Out Of Stock Control? How to list products which have stock management disabled? Why do I get "Invalid API License Key" when I try to activate my license? Can I use WP-Lister to list cars and other vehicles on eBay Motors? Anything I should know about Fridays? Error 732: Invalid or missing PayPal email address. Can I run the import every day or week to add new items from eBay? What are the server requirements to import 1000 items or more from eBay? Does the plugin import product categories from eBay? 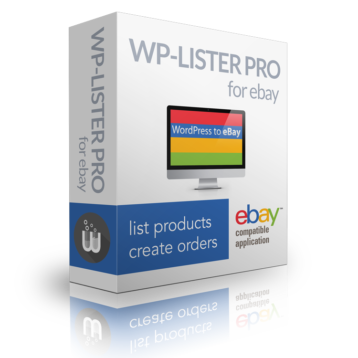 Can I use the importer without WP-Lister? How will the importer extract item descriptions from a predesigned listing template? I don’t have an eBay store. Will the plugin import eBay categories then? I currently use Auctiva. Can this plugin import my products to WooCommerce? How do I get all imported items to use my WP-Lister template? Is there a way to check if my current listings comply with eBay’s image-size policy?